Subscribe to Oregon Business magazine OR renew your subscription today. Qualified readers in Oregon and Washington get a FREE Subscription to Oregon Business. (You'll get both print & digital!). You can also manage your subscription and access your digital edition below. Want to receive our FREE weekly enewsletter? Enter your email below. Containing the same sections and graphics as our printed version, the digital edition is a page-turning replica viewable on any computer. Let the editors of Oregon Business bring you a treat during your workday. Our Oregon Business Daily e-newsletter gives you the top business headlines of the day, compelling business polls, Oregon Business stories, and blogs & rants from our editors and columnists. Sign up below! Oregon Business Magazine takes your privacy seriously. Please read the following information to learn more about our privacy practices. This policy covers what personally identifiable information Oregon Business Magazine collects and how it is treated. Personally identifiable information is information that can be used to identify visitors to the http://www.oregonbusiness.com Web Site. This information may be limited to an IP address or extend to personally identifiable information such as your name, address, email address, or phone number. This policy only applies to http://www.oregonbusiness.com and does not extend to the practices of other Web Sites that we may link to, companies that we do not own or control, or to people that we do not employ or manage. When visiting Web Sites certain information about you and your computer can sometimes be collected. This section explains what information Oregon Business Magazine collects, and how it is used. Oregon Business is a product of parent company Mediamerica, Inc. When your message needs to reach the largest possible business audience, there is only one choice: Oregon Business, the magazine of choice for Oregon's top executives. For inclusion in our online Sponsored Sections for events, press releases, and more, please contact the Associate Publisher about sponsorship opportunities. Oregon Business is an award-winning magazine founded in 1981. The magazine reaches more than 20,000 business, political and civic leaders across the state. It reports on a wide range of such big-tent topics as leadership, innovation, technology, culture, politics and environment. In addition to the print magazine, the OB editorial staff produces OregonBusiness.com and a Monday-Friday e-newsletter. The website features original commentary and reporting from Oregon Business bloggers, contributed opinion pieces, business tips columns and other web exclusive content. Oregon Business is recognized for its pioneering workplace surveys. 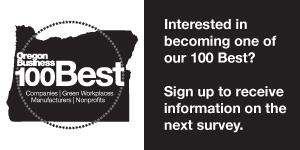 The signature research project of the magazine is the 100 Best Companies to Work for in Oregon, and its two companion projects, the 100 Best Nonprofits and the 100 Best Green Companies. See Op-Ed and Business Tips submission guidelines here. For information about OB internships, click here. Input: a survey of what OB readers think about current topics.